Terre Haute is taking the lead in examining the issue of environmental sustainability. The community will host Indiana's first GreenTown summit Nov. 16-17 at Indiana State University. The event, which will take place at University Hall, is designed to bring the public and private sectors to create healthy, sustainable communities. Sponsored by Our Green Valley Alliance for Sustainability, "GreenTown: The Future of Community" will feature speakers and workshops designed to work toward creating a sustainable Wabash Valley. Terre Haute is becoming a city which is much more aware of itself and how the things that it does make an impact on the state and on people in the community," said Sister Jean Knoerle, president of Our Green Valley Alliance and president emerita of St. Mary-of-the-Woods College. "When we founded Our Green Valley Alliance, we wanted to be a part of this new understanding in the city." Terre Haute is home to Wabashiki Fish and Wildlife Refuge, the largest facility of its kind in any urban area in the Midwest. The city and Indiana State University are working together to further develop Indiana's state river for recreation while protecting the environment along the waterway. "Indiana State is committed to sustainability and is pleased to help broaden these efforts by hosting this conference," said ISU President Dan Bradley. "There is much more that can be done, and it is great to see the momentum growing in our community for more sustainable practices." Bradley will deliver a welcome address along with Terre Haute Mayor Duke Bennett. Several ISU classes will be in attendance, and Jim Speer, professor of earth and environmental systems at Indiana State, will talk about the university's sustainability efforts. Sue Sluyter, head of food service at ISU, will detail Sodexo's work to create quality food with a local, organic and healthy approach. Green jobs, healthy food and community sustainability planning will be key components of GreenTown. On Nov. 16, two half-day events will be held focusing on colleges and universities and on primary education. The Terre Haute folk band "Yearbook Committee" will perform a free concert at 8 p.m.
Bob Dixson, mayor, Greensburg, Kan. In 2007, the town ofâ€¨Greensburg, Kan. was destroyed by an F5 tornado. Mayor Dixson is now leading his communityâ€¨in becoming environmentally andâ€¨economically sustainable by utilizing theâ€¨latest in renewable energy, emphasizing walkability and rebuilding all municipal structures to LEED Platinum certification. Richard Jackson, M.D., professor of health, University of California at Los Angeles; author, "Urban Sprawl and Public Health"
Jackson is a medical doctor and chair of the environmental health sciencesâ€¨department at UCLA. In addition to writing books and conducting researchâ€¨on the effects of pesticides on humanâ€¨ health and the environment, Jackson argues passionately for how we can live healthier lives through food, exercise and doing a better job of planning and developing our built and natural environments. Scott Russell Sanders, Distinguished Professor Emeritus of English, Indiana University; author, "A Conservationist Manifesto"
A Bloomington resident, Sanders will talk about hisâ€¨perspective on the human place inâ€¨nature, the pursuit of social justice, theâ€¨relationship between culture and geography and the search for a spiritual path. He is the author of 20 books of fiction and nonfiction. He taught at Indiana University-Bloomington from 1971 to 2009. Cost to attend GreenTown Terre Haute varies depending on whether participants are students, members of not-for-profit organizations or non-affiliated community members. The full program, along with pre- and post-conference workshops and registration links, is online at www.greentownconference.com. GreenTown is co-produced by Seven Generations Ahead, an environmental organization that advocates for development of ecologically sustainable and healthy communities and assists clients in implementing zero waste strategic plans and composting initiatives to foster linkages between local farmers and school food services; and a5, a brand consultancy with experience in sustainability, healthcare, non-profits and communities. In 2007, a5 founded GreenTown with Seven Generations Ahead and since then has produced nine GreenTown events in the Midwest. GreenTown's Terre Haute sponsor, Our Green Valley Alliance, includes the city of Terre Haute, Downtown Terre Haute Inc., Indiana State University, Saint Mary-of-the-Woods College, Rose-Hulman Institute of Technology, Ivy Tech Community College, Union Hospital, Vigo County School Corporation, Trees, Inc., Wabash Valley Community Foundation and the White Violet Center for Eco-Justice. 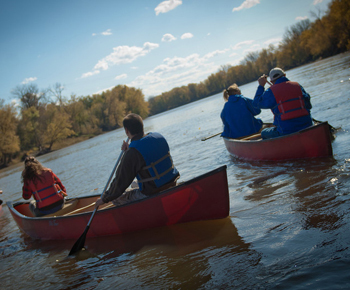 Photo: http://isuphoto.smugmug.com/photos/i-3phm5wd/0/D/i-3phm5wd-D.jpg - Indiana State University students traveled an eight-mile stretch of the Wabash River by canoe Oct. 29, 2011. Efforts by ISU and the city of Terre Haute ato develop the river for recreation while protecting the valuable natural resource will be among topics discussed at GreenTown Terre Haute Nov. 16-17.